Just wondering if anyone has swapped a ramcharger gas tank into a truck? I'm woring on my '85 shortbed...getting ready to swap on a warlock step side and am wanting to put a the rear mount tank in the truck like whats in the ramcharger. 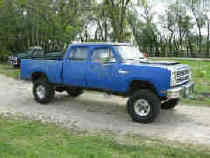 That way I could have the exhasut wxit in front of the rear wheels and modify the fuel door into the bed of the truck. If anyone has done this before and has any advice, I would greatly appreciate it. I was going to that to my shorty but, my dual exhaust exits behind the rear axle via the right rear. The tank hit one of the pipes and I didnt want to redo the exhaust. There would be no probs using a factory single pipe out the rear with a big tank. Even using a 3" Diesel tail pipe should clear. You will need the cross members and tank straps from the RC. My big RC tank is now destined to go in the back of my dually and the aux tank from that to the shorty. Just trying to find another shorty fuel filler neck.. When I narrowed the rear on my truck I went with a fuel cell mounted under the bed. I never thought about the RC tank. I didn't realize that it's in the rear. Can anyone post a picture? I like the idea of the RC tank. It's funny, I was just going to post some pictures of the Ramcharger tank that I put in my ex-cab short box. This summer I was thinking about weight distribution in my short box. On the driver side you have a 40 lb battery, I weigh in at just under 200 lb's and if your tank is full there would be another 200 lb's or more right under the driver. I measured the short box and the Ramcharger frames and to my surprise they were the same lenth from the front spring eye to the end of the frame. I removed the Ramcharger rear cross members and had them sand blasted and painted. When I installed the cross members in the short box frame some of the mounting holes were already there and that made it alot easier. I will have to finish running the gas lines in the spring as our snow came early this year. As you can see by the pictures that it fits and looks good. I still have not removed the old tank. I also removed and painted the cross member that the shocks mount to. I like the RC tank idea much better than the fuel cell I used. First of all the fuel cell is 14 gallons so to keep the 440 fed I have to stop pretty often. And I've never been able to get a sender for the fuel cell that works correctly with my gauge. How many gallons are those RC tanks? I thought about getting a fuel cell but I already had the ramcharger tank and brackets. The tank sticks up higher than the frame at one end. I have not tried to installed the box yet. I hope it will not hit the tank. I don't know how much the ramcharger tank holds but I think it's alot bigger than your fuel cell. The big tank is 36 gallons. There is a smaller one, it is 24 gallons, but I have only seen the larger tanks. Last edited by 77BBPW; 12/09/06 09:42 AM. here's the big one on e-bay. FYI The fullsize Van tanks are quite similar to the RamCharger or may be the same, when you are looking thru a junkyard. My 72 B300 Maxiwagon had a 24 gal metal tank IIRC. Been gone about 22 years. Every electronic device is manufactured with smoke stored deep inside... only a true genius can find a way to set it free. The most terrifying words in the English language are: "I'm from the government and I am here to help!"